A summer in Hochpustertal turns your holiday into an unforgettable experience. It’s the symbiosis of the fascinating mountains and summits on the South Tyrolean Dolomites, the delicacies in the Leitlhof Hotel Restaurant and the cultural occasions and events in Innichen and its environs that ensure a perfect holiday for you. The perfect activity holiday at the Leitlhof Hotel – Dolomites – is round off by a relaxing feel-good cure in the middle of the blossoming Hochpustertal landscapes. The spectacular sunrise on the Helm is definitely one of the unforgettable experiences during your holiday. The early ascent by cable car, the bonfire on the summit and the shimmering sea of colours in the sky over the Dolomites will enchant you. 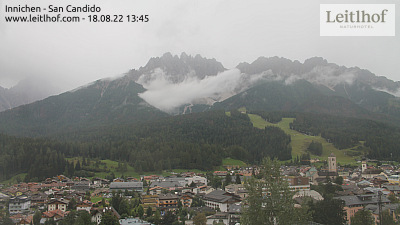 The majestic mountain panorama also opens up in front of you on other Dolomite Alps’ mountain tops, which you can reach via great via ferratas in your holiday region. Enthusiastic mountaineers and climbers can test their limits on these tours. Being free of giddiness and surefootedness are crucial on the via ferratas. Your feel-good board is all about the typical South Tyrolean cuisine in July. The wide range of culinary highlights created by chef Hermann Patzleiner and his team includes dumpling specialties and polenta variations, amongst others. The typical South Tyrolean wines round off the indulging experience perfectly. The Gustav Mahler Music Weeks attract several fans of classical music to Toblach in Hochpustertal. The Messner Mountain Museum in Bruneck is the perfect place to bridge possible bad weather days. The market centre in Innichen is celebrated in July: Experience the Innicher Marktlfest and the sportive atmosphere during the Dolomiti Superbike. During your holiday in South Tyrol July will become a true highlight. Send us your no obligation holiday enquiry. The Mühlmann family is looking forward to welcoming you!